ECB to leave rates on hold at 3.5%? The European Central Bank is expected to leave interest rates at 3.5% today but it’s also expected to signal a rates increase in March. Today at the press conference following the ECB rates decision all ears will be listening out for bank chief Jean Claude Trichet using the phrase “strong vigilance”. This is because every rate hike since the ECB began raising rates in December 2005 has been preceded by a warning of “vigilance”. Meanwhile the Bank of England is expected to keep interest rates on hold at 5.25% today, but after last month’s shock rates hike another is possible today. Basically ABM Ambro are predicting an ECB of 4.5% this year. This is the highest rate prediction that I’ve seen by any bank yet. Closer to home Davy’s are quoted as saying that the peak of 4% looks shaky. Another mention of the fact that a June rate increase would be signaled at the ECB meeting here in Dublin just before the General Election. Current rate is 3.5%. 4% looks like an absolute certainty. Euro Area money supply growth hits a 17 year high in January putting further pressure on interest rates. The European Central Bank has raised its main interest rate by a quarter of a percentage point to 3.75% after its meeting in Frankfurt today. The move was widely expected. The last time ECB interest rates stood at 3.75% was in September 2001. The bank has now raised its key rate seven times since December 2005, each time by a quarter of a percentage point. The last move was on December 7. Top ECB officials, including president Jean-Claude Trichet, had carefully prepared financial markets for the interest rate move. They have signalled that the bank remains worried about risks from inflation. AdvertisementBanks and others lenders are now expected to now fully pass on the rate rise to mortgage borrowers. It will add about â‚¬15 to monthly mortgage repayments for every â‚¬100,000 newly borrowed. 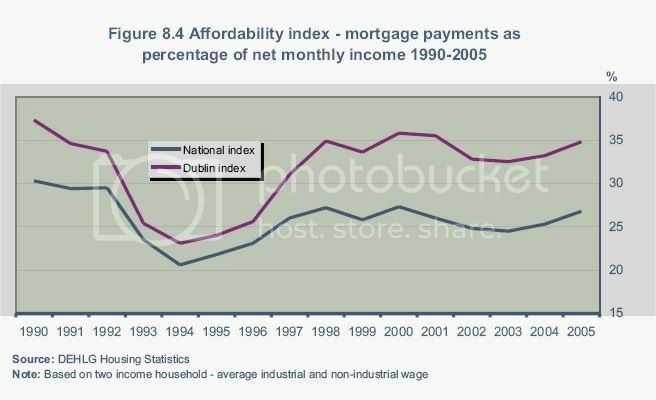 Added to the the other six increases announced since December 2005, it means that in just 15 months mortgage borrowing costs will have risen by â‚¬105 a month for every â‚¬100,000 borrowed. Unfortunately for mortgage holders and house-buyers, economists are expecting that the ECB may have to raise interest rates further in the months ahead. Halifax has increased its monthly saver account rate by 0.35% to 7.00%, which betters the 0.25% ECB rate increase today. The bank says it is the best interest rate available in Ireland, and promise it will stay at least 1.5% above the ECB base rate until January next year. The European Central Bank has said inflation is still a threat to the euro zone economy, again hinting that it might have to raise interest rates further. It’s worth taking a look at the betting market of betfair.com to gauge the likelyhood of a rise in interest rates. At the moment, it’s not an undistant possibility. Online and in real time: ECB press conference, from Dublin, Ireland. At 2.30 p.m. CET the ECB President and Vice-President explain the Governing Council’s monetary policy decisions and answer journalists’ questions. No fear of that in the foreseeable future, we are getting the boiled frog treatment with regard to interest rates. Axel Weber seems to be one of the most hawkish ECB members, and as the resident German on the council, is probably second only to Mr. Trichet in terms of clout. It’s interesting what he’s saying about code-phrases. I mentioned this a month or so ago that I felt that most commentators were coming to rely on the code-phrases rather than looking at the facts available. Economists were revising their peaks upwards by .25% every few months, nearly always 4 months before their old “peak” was due i.e. just after the meeting where Trichet would copperfasten the hike due in the following month. The effect being that there always seemed to be just another couple of hikes before the peak. Not good news if you want a stop to interest rate rises. A raised inflation forecast would be very bad news indeed. May 30 (Bloomberg) – European Central Bank council member Nicholas Garganas said the bank will probably raise its inflation forecast next month and is keeping options ``open’’ on interest rate increases after June. The Frankfurt-based ECB in March forecast inflation to average about 1.8 percent this year, holding below its 2 percent limit for the first time since 1999, before accelerating to around 2 percent in 2008. Some of the assumptions of the forecast for this year now appear to be ``rather optimistic,’’ Garganas said. Up a quarter of a percent as expected. Any bets on what will be said at the press conference? Will the word “accommodative” be used? It’s like central banks for dummies, I’m not surprised they want to dump the use of key words. The European Central Bank (ECB) has raised interest rates for the eurozone to 4% from 3.75%. The increase takes rates in the area to their highest level for six years and means they have doubled in 18 months. The rise had been expected following a series of inflationary warnings from ECB members in recent weeks. At his news conference, ECB president Jean-Claude used a form of words to suggest there may be more rate rises this year, but probably not next month. The eurozone economies, especially Germany, have been growing strongly in 2007. Unemployment is at its lowest level since the launch of the euro while confidence is high and business activity is expanding. Mr Trichet said that eurozone monetary policy is “still on the accomodative side,” which analysts interpreted to mean that he was prepared to allow this growth to continue. If Mr Trichet had dropped the word “accomodative” from the statement, it would have suggested that rates were approaching their peak. And the ECB president did not use the term “strong vigilance”, which he used in May as a signal that rates would rise this month. He said that the Governing Council would “monitor closely all developments”. In the past, saying that he was watching inflation “very closely” meant that a rise was a few months away. The ECB’s benchmark rate is the minimum bid rate for its regular refinancing operations, which is the one that has been raised from 3.75% to 4%. Its two other key rates have gone up by the same amount. The deposit rate is now 3% and the marginal lending rate is 5%. So no sign of another rise in July or August then. Surely by September and another in Nov/Dec likely at this stage too? His use of “still on the accommodative side” is huge news. It means that rates are still not at a neutral level as far as the ECB is concerned. With the recent comments that rates may have to go a restrictive level, 2 more rises are almost guaranteed. Dermot O’Leary of Goodbody was on the radio the other evening saying that he’d lean towards a pause at 4.25% although he admitted that some other economists expected 4.5% to be the peak. I think Irish economists are simply looking at this the wrong way. They’ve become so used to the gravy train of cheap credit that they believe that the ECB think like them, i.e. low rates are great so don’t raise them unless you have to. What’s clear to me is that the ECB think quite the opposite to this - raise the rates unless events dictate otherwise. I’ll say it again - 5% is quite possible in this cycle, 5.5% isn’t impossible either. The thing is that what level qualifies as ‘neutral’ rates varies depending on other economic conditions - a rate which would choke a faltering economy might well be overly loose in a booming economy, due to sentiment. They apparently maintain an internal estimate of what the neutral rate is, but i haven’t seen it publicly. Considering that europe is growing strongly at the moment, they may easily consider ‘neutral’ to be in the region of 4.5% - which means the peak will be above that. Barring an external shock, we’re heading for 4.5% minimum by next year.